Many businesses and non-profits in Republic County may not be aware they could qualify for various signage programs. The Tourism Signage Program was developed to increase awareness for travelers and residents of tourism operations and attractions. It ensures that road signage for tourism attractions is consistent with road safety and other road and traffic objectives, and provides effective guidance in directing tourists and visitors to tourism facilities. To review the guidelines and apply, please view Signage Application and Guidelines. For details, please email Colby Terry or call 785.296.8951. 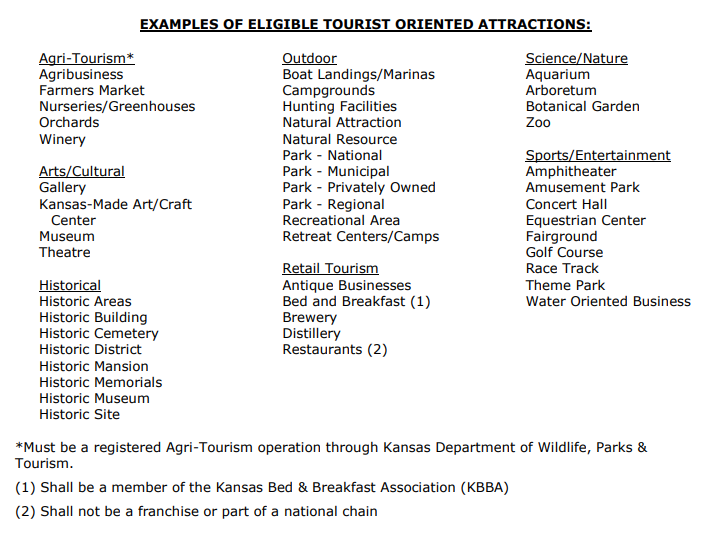 For inquiries on how to obtain all other types of signage please visit the KDOT website page for signage.